The ever popular Star Wars movies are a super way to get boys reading. I know so many boys were anxiously waiting for the new movie to come out. The interest level is high right now! These Star Wars dictionaries and encyclopedias are just the ticket. They are packed with facts, are very visual and Star Wars fans can’t put them down once they pick them up. We pulled together another of our best books for boys lists and focused on non-fiction Star Wars books that boys will really go for. This list is up-to-date and includes the latest books from The Force Awakens. There are a lot of Star Wars dictionaries and encylopedias out there. Some of them are great and others, well, not so much. These are the best ones available right now. Grab a few of these and leave them out for your boy. He will really enjoy them! Star Wars: The Force Awakens Visual Dictionary Oh boy! This one is hot off the press and features details, details and more details about the movie. Next is an oldie, but a goodie: Star Wars: The Complete Visual Dictionary This is an excellent book that covers all of the Star Wars movies leading up to the current one. They say it “chronicles every character, weapon, starship, droid, creature, and alien in the Star Wars universe” and they are right! Star Wars Character Encyclopedia has more than 200 character profiles in it. Each has one page with a large picture of the character and details including additional pictures. We love cross-section books and so do the boys we know. Picture ships cut in two and you get to take a peak inside and see all of the details. Star Wars: Complete Vehicles Cross-sections covers six Star Wars movies. A bit more expensive, but it is four books in one, Star Wars Complete Cross-Sections: The Spacecraft and Vehicles of the Entire Star Wars Saga . 152 page hardcover, coffee table book with vehicles galore. If you have been hanging out on the Brain Power Boy website for a while, you will know that we love LEGO! 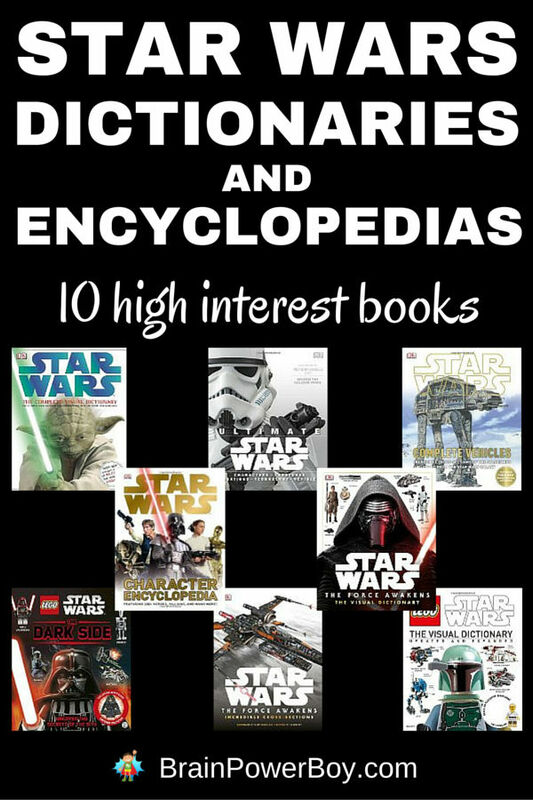 Here are a few favorite LEGO Star Wars dictionaries and encyclopedias. These are awesome and we always look forward to the new releases. LEGO Star Wars: The Visual Dictionary: Updated and Expanded We were excited to see this one come out again with new entries. Filled with characters, locations, creatures, and spacecraft from the LEGO Star Wars world, this will keep a boy’s interest for a long time to come. LEGO Star Wars Character Encyclopedia: Updated and Expanded This is all about the characters – LEGO minifig style. And, of course, we can’t forget LEGO Star Wars: The Dark Side . If Star Wars is on the minds of your boys, get them reading by giving them some of these books. They are about guaranteed to be a hit. For more Star Wars goodness be sure to check out these as well! Star Wars Learning Activities That are Out of This World!